On the site of the present High Lighthouse there has been a beacon for mariners since 1676 when it was coal fired and burning night and day. Lowestoft Highlight was the first lighthouse erected by the Brotherhood of Trinity House. It lasted until 1676 when a brick and stone replacement was erected, and a plaque was placed inside the building which can still be seen today. It reads, ‘Erected by the brotherhood of Trinity House, Deptford Strond in the Mastership of Samuel Pepys, Esq., Secretary of Ye Admiralty of England A.D. 1676.’ In 1778 its visibility was improved by the use of oil lamps and reflectors. The present building seen high above the Museum, was built in 1874 and used oil lamps until 1938 when it was converted to electric lighting. At that time three keepers were needed and they lived in the building making it a popular posting for men of the Trinity House Light service, today only one keeper is required. At night, as the beam passes an observer’s line of sight, two points of light are visible; each point is a 1,000 watt electric lamp. In front of each lamp is a set of optics producing a beam visible on a clear night at 20 miles (36 km) distant. 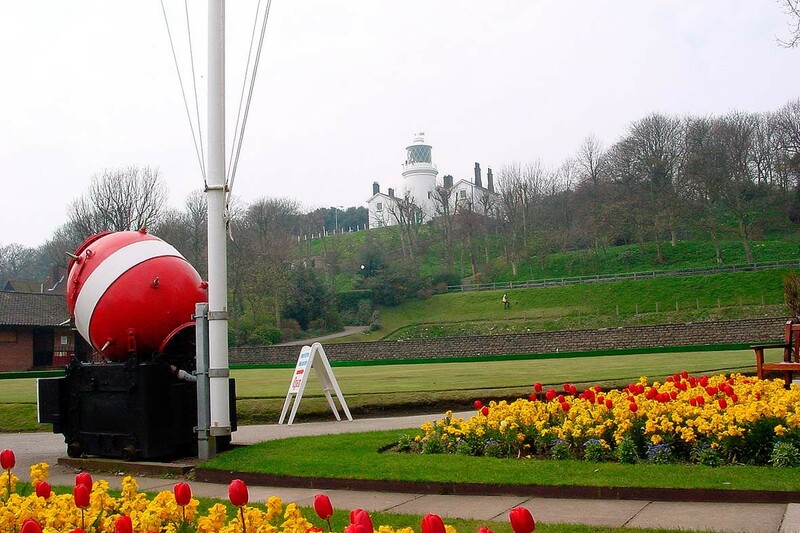 It is one of the most powerful navigation lights in the United Kingdom. In 1976 the light was automated and the timing functions were taken over by ‘solid state’ electronics; the museum now has the original mechanical clock that was powered by weights hanging within the tower, see pic right. This is quite a powerful mechanism as can be seen from the substantial shaft at the top that rotated the lantern directly via a bevel gear just visible at the bottom of the vertical shaft. It is a lesson in high reliability engineering, beautiful encased bearings and a governor at the bottom stabilising the speed and allowing it to be set accurately. Subject only to weights being wound, it was completely immune from power failure. The earliest Low Lighthouse was a wooden structure which was discontinued in 1706, however it proved to be essential and was established again in 1730. Its purpose was to allow mariners to line up the Lowlight and Highlight beams to navigate a passage through the Stanford Channel between the sandbanks outside the harbour. It was repaired several times until 1866 when it was replaced by the wrought iron structure, shown above, that was capable of being moved either for alignment with the Highlight or because of erosion of the beach. See Neville Long’s excellent book ‘Lights of East Anglia’. The picture reveals more details, a fog horn is visible, it could have been steam driven from a small coal fired boiler. There is also a pole to run up flag signals, thus it was more than a navigation light. The lightkeepers cottage stands to the right.